Stellar Repair for Photo offers a complete solution for repairing corrupted photographs and image files having a number of extensions. It can repair image files that get stored in a hard disk of computer, memory card or any other storage media. ARW, CR2, CRW, DNG, ERF, JPG, MRW, NEF, NRW, ORF, PEF, RAF, SR2, SRF, TIFF and RW2. Repairs corrupted photographs and image files. Extracts thumbnails existing within the files. Preview repaired image files before saving them. Supports Windows 10 / 8.1 / 8 / 7. Stellar Repair for Photo software has a very easy to use Graphical User Interface. The user interface contains features required for the repairing process. The user interface contains Buttons that let you access various features of the software with ease. When you click this option, ‘Select Images’ window appears from where you can locate and select desired image file(s) to repair. All the selected files will get listed in the application. When you click this option, ‘Select Images’ window appears from where you can locate and select desired image file(s) to repair. All the selected files will get listed in the application. By default, check boxes for all the selected files are checked. Uncheck the files that are not required. Click this button to read information about Stellar Repair for Photo. Click this button to open user help guide. Click this button to check for both, major and minor updates to the software. Click this button to buy Stellar Repair for Photo online. Use this button to repair severely corrupted images. Click this button to abort the repairing process. This button is used to save the repaired file. Use this option to select or deselect all the listed files. Use this option to hide or show thumbnails of the image files. Click this button to move to the previous screen. The demo version is just for evaluation purposes and must be eventually activated to use the full functionality of the software. The software can be activated using the Activation Key that you receive via email after purchasing the software. 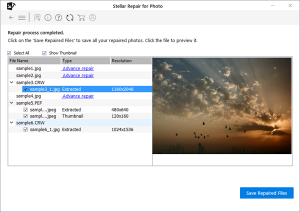 Run the demo version of Stellar Repair for Photo software. If you don’t have the activation key, click the Get it now button in the dialog to go online and purchase the product. Once the order is confirmed, an Activation Key will be sent to the email provided. Type the Activation Key (received through email after purchasing the product) and click Activate button (Please ensure that you have an active Internet connection). The software will automatically communicate with the license server to verify the entered key. If the key you entered is valid, the software will be activated successfully. The ‘Activation completed successfully ‘ message is displayed after the process gets completed successfully. Click OK.
Update feature available in Stellar Repair for Photo allows you to check and install the latest updates for the application. That will help you keep your application up-to-date. If updates are available for the product, update wizard pops up while you run Stellar Repair for Photo. Run Stellar Repair for Photo. 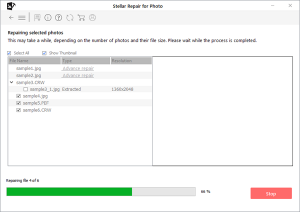 Stellar Repair for Photo repairs corrupt and damaged image files and allows you to save them at a location of your choice. 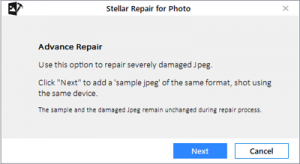 You can repair individual or multiple files by using Stellar Repair for Photo. Using the ‘Add File‘ option you can add a single or multiple files to repair. Run Stellar Repair for Photo software. On the main user interface, Click Add File button. Select Images dialog appears. Choose the location from where you want to select the image file. Click Open button. After adding the files for repair, you get a window as shown below. In the Home screen, use Add File to add image files in the list. In the list, check files that need to repair. You can use to select/unselect all files. Click Repair to start the repairing process. Once the repairing process is complete, the Repair Complete dialog box gets displayed. Click OK.. In case your image file is severely corrupted, the application allows you to repair it by adding a Sample File to it. The Advance Repair feature is available only for the JPEG/ JPG files. A Sample File is a working file created from the same device and of the same format as of the corrupted file. However, it can be of any size. 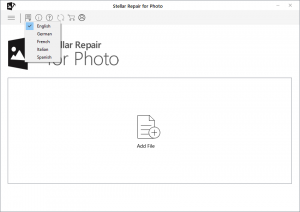 Stellar Repair for Photo uses the information from the working sample file and repairs the corrupted file. From the list of image files, click Advance Repair link under the Type attribute. 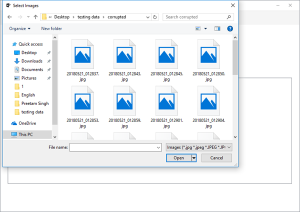 Select the option ‘Apply to all jpeg of same format‘ to use the selected sample file for repairing all the corrupted jpeg files in the list. A ‘Repair complete’ dialog appears. You can select repaired image files to save at the desired location. In the preview window select a file in the left pane to view it. In the left pane, check the files that need to be saved. Thumbnail and extracted/ repaired image(s) of the files gets displayed in the preview window along with the original file. You can check/ uncheck to show/hide thumbnail(s). Click Save Repaired Files. ‘Select Folder‘ dialog box is displayed. Select a location for saving image files in the dialog box and click OK. Repaired Files folder is automatically created at the specified location. Click Click Here to open the folder where the repaired files are saved. If the repaired files are being saved on the same location, ‘Folder Exists‘ dialog will display with the option to Rename/ Overwrite the files. Click Rename if you want to rename the folder. The folder will be saved on the specified location. Click Overwrite if you want to replace the previous repaired files folder with the new one. 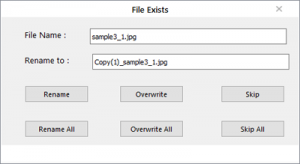 ‘File Exists’ dialog box opens. If you want to rename the image, click Rename/ Rename all. If you want to overwrite the previous images, click Overwrite/ Overwrite all. In case, you don’t want to perform any action click Skip/ Skip all. Note: The Thumbnails of the repaired JPEG files (if available) gets saved in a separate folder within the Repaired Files folder. In order to use Stellar Repair for Photo software in your preferred language, the application provides an option to select any of the desired language. Using the Languages button on the main user interface, you can change the entire application to a different language at any time/instance without having to re-install the application. Note: The application supports the following languages: English, French, German, Italian, and Spanish. Demo version of the software is only for evaluation and shows a preview of JPEG files. To save repaired files, you need to purchase and register the product. JPEG stands for Joint Photographic Experts Group that created the JPEG/JPG standard for lossy compression of digital photography (image). RAW images are uncompressed digital photos that save image data exactly the way the image was captured by camera’s sensor. Because raw images are not compressed, they take up significantly more disk space than their JPEG counterparts (usually at least twice as much). However, because the original image detail in raw images is not compromised by image compression, they are higher quality than JPEG images. Does the software repairs image file in the same format? No, the software repairs the image file in JPG format. Why am I getting an “Invalid Image” message, when I am selecting a JPEG file for repair? What does NAME_T1.jpg, NAME_T2.jpg mean? When you scan images for repairing, Stellar Repair for Photo software will scan and then list them. You will also be able to preview the image. Now, images which have thumbnails will get listed along with all its thumbnails. The thumbnail images will be named as IMAGE_NAME_T1.jpg and so on. T1, T2 is the name of the thumbnail of the same image. If an image has four thumbnails, it will get listed as IMAGE_NAME.jpg, IMAGE_NAME_T1.jpg, IMAGE_NAME_T2.jpg, IMAGE_NAME_T3.jpg, and IMAGE_NAME_T4.jpg. Why are some JPEG files not completely repaired? An image file is made up of two parts namely the file container and image data. The container is the common structure which uniquely defines JPEG image. If the container of a JPEG file is damaged or is corrupt, then Stellar Repair for Photo software will not be able to identify the file as a JPEG file, and you will get an “Invalid image” message. In case, the container of a JPEG file is intact, but its image data is corrupt even then Stellar Repair for Photo will be able to repair the image. Such a repaired image will have defects like loss of color, or a part of the image will be missing. These defects are due to image data being corrupt. In such situations, there is an advise that you try and extract the thumbnail of the image (if any). 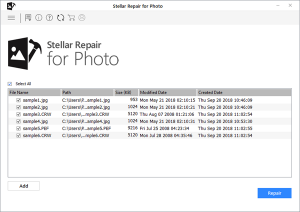 Stellar Repair for Photo software, accompanied user manual and documentation are copyright of Stellar Information Technology Private Limited, with all rights reserved. Under the copyright laws, this user manual cannot be reproduced in any form without the prior written permission of Stellar Information Technology Private Limited. No Patent Liability is assumed, however, with respect to the use of the information contained herein. Copyright © Stellar Information Technology Private Limited. INDIA. Stellar Repair for Photo® is a registered trademark of Stellar Information Technology Private Limited. Windows 7, Windows 8®, Windows 8.1® and Windows 10® are registered trademarks of Microsoft® Corporation Inc. If you do not agree to all of the terms and conditions of this License then do not copy, install, distribute or use any copy of Stellar Repair for Photo with which this License is included, you may return the complete package unused without requesting an activation key within 30 days after purchase for a full refund of your payment. The terms and conditions of this License describe the permitted use and users of each Licensed Copy of Stellar Repair for Photo. 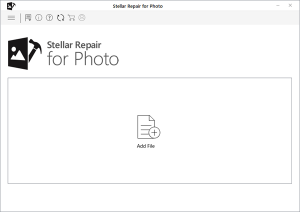 For purposes of this License, if you have a valid single-user license, you have the right to use a single Licensed Copy of Stellar Repair for Photo. If you or your organization has a valid multi-user license, then you or your organization has the right to use up to a number of Licensed Copies of Stellar Repair for Photo equal to the number of copies indicated in the documents issued by Stellar when granting the license. 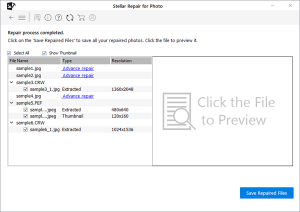 Each Licensed Copy of Stellar Repair for Photo may either be used by a single person or used non-simultaneously by multiple people who use the software personally installed on a single workstation. This is not a concurrent use license. All rights of any kind in Stellar Repair for Photo, which are not expressly granted in this license, are entirely and exclusively reserved to and by Stellar Information Technology Private Limited. You shall not rent, lease, modify, translate, reverse engineer, decompile, disassemble or create derivative works based on Stellar Repair for Photo nor permit anyone else to do so. You shall not make access to Stellar Repair for Photo available to others in connection with a service bureau, application service provider or similar business nor permit anyone else to do so. Stellar Repair for Photo and all accompanying software, files, data and materials are distributed and provided AS IS and with no warranties of any kind, whether expressed or implied. You acknowledge that good data processing procedure dictates that any program including Stellar Repair for Photo must be thoroughly tested with non-critical data before there is any reliance on it and you hereby assume the entire risk of all use of the copies of Stellar Repair for Photo covered by this License. This disclaimer of warranty constitutes an essential part of this License. In addition, in no event does Stellar authorize you or anyone else to use Stellar Repair for Photo in applications or systems where its failure to perform can reasonably be expected to result in a significant physical injury or in loss of life. Any such use is entirely at your own risk and you would not hold Stellar responsible for any and all claims or losses relating to such unauthorized use.